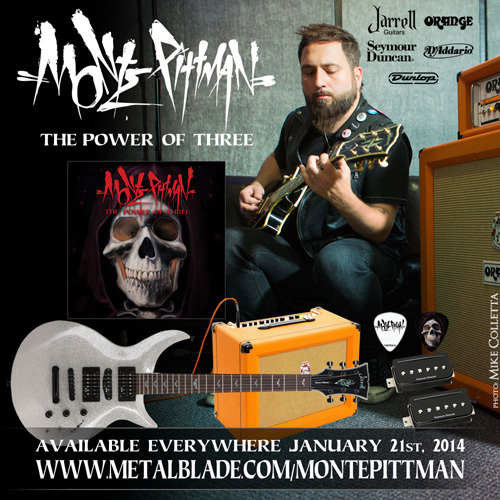 The Power of Three, the upcoming full-length album from award winning, chart topping guitarist, MONTE PITTMAN is set for release on January 21, 2014 through Metal Blade Records. The first single, ‘A Dark Horse‘, is currently streaming at metalblade.com/montepittman where fans can also check out the first of five demonstration videos filmed at Orange Amplification‘s studios where Monte filmed a series of high quality videos demonstrating ALL Orange Amplification products. ‘A Dark Horse’, the first single from Monte’s third album, reflects Monte’s return to his metal roots while demonstrating his Orange gear sound and tone to perfection. Flemming Rasmussen, famous for Metallica’s seminal album ‘Master Of Puppets’, produced the album, The Power Of Three, which is hard and heavy and follows on from Monte’s highly successful, critically acclaimed second album Pain, Love & Destiny, which reached number one in both the rock and pop charts. Artist Cam Rackam created the artwork for the cover of The Power of Three. The piece features a portrait of Charon, the ferryman of Hades who carries souls of the newly deceased across the rivers Styx and Acheron that divided the world of the living from the world of the dead. This represents Monte’s musical journey from what he has done before and where he is now with The Power of Three and beyond. The first single ‘A Dark Horse’ is also available now as an iTunes single HERE and features artwork created by Gustav Klimt (used with kind permission) titled ‘The Golden Knight (Life Is A Struggle)’. It is a textured, symbolic painting which tells a similar story as the music does. Catch MONTE PITTMAN live at one of his upcoming performances listed below and stay tuned for info on 2014’s NAMM demonstrations and performances. Born and raised in Longview, TX, Monte Pittman made the decision at 24 to move to Los Angeles to pursue a career as a professional musician, and unfortunately having to leave his family, friends, and band Myra Mains behind. Upon arrival in LA, he made ends meet by working at a local music store. Realizing he was better at teaching than selling, he left to start providing guitar lessons. In November 2009, Monte released his debut acoustic solo album, “The Deepest Dark.” Almost a year after its release, a special bonus version of “The Deepest Dark” was released and immediately reached the No. 1 spot on the Best-Selling Acoustic Albums list at CD-Baby.com. It was also No. 9 in the Top 10 Best-Selling CDs for the Fall of 2010. In 2011, Monte launched a Kickstarter campaign for his second album, “Pain, Love & Destiny”. It raised a staggering $65,500, making him the top rock musician to raise the most money on the crowd-funding platform at that time. Monte met his initial goal of $5,000 in under 24 hours. It was released later that year and within its first week made it to No. 1 Rock Album, No. 1 Pop Album, and made it onto the Top 10 Albums chart on CD Baby. In addition, it cracked the iTunes Top 200. Monte performed at the 2012 Super Bowl with Madonna and toured around the world on the MDNA Tour. He also performed at the 2012 Artists In Music Awards where he was given an award for Best Solo Artist in addition to being nominated in four other categories. Monte has also been honored with a Career Achievement Award from the Hollywood F.A.M.E. Awards. The Los Angeles Music Awards nominated him for Best Male Singer/Songwriter and Best Modern Rock Album for “Pain, Love, & Destiny”. In November of last year, “M.P.3: The Power Of Three, Pt. 1” was released. It’s a stripped down acoustic EP marking the beginning of Monte and Flemming Rasmussen’s working relationship. In 2013, Pittman, along with band members Kane Ritchotte on drums and Max Whipple on bass, went to Copenhagen to record the upcoming album with producer Flemming Rasmussen. This marks Monte’s return to heavy music. 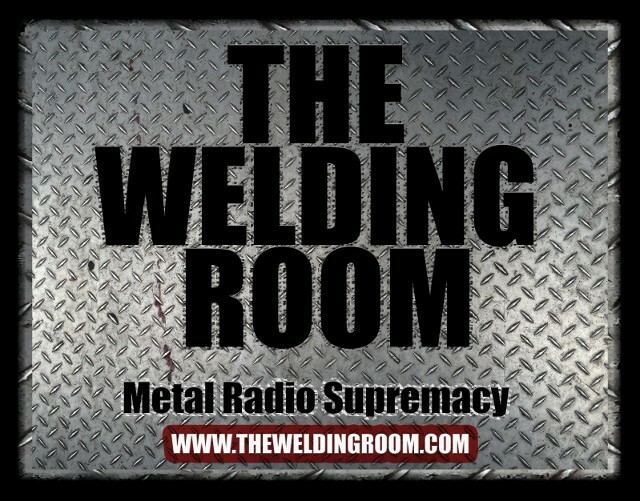 This entry was posted in METAL and tagged Dark Horse, Dark Horse Comics, Flemming Rasmussen, Gustav Klimt, iTunes, Madonna, Metal Blade Records, Metallica, Monte Pittman, Orange Amplification, Power Of Three. Bookmark the permalink.